We met what we called the CSS box model way back in instalment 7, but we really should have called it the default CSS box model. To understand why there is more than one box model, let’s go back in time to the very earliest days of CSS. Back then there was no W3C facilitating web standards, each browser manufacturer did their own thing, and tried to convert their way of doing things into a de-facto standard through ubiquity. In the grand scheme of things the manufacturers agreed on far more than they disagreed on, but when it comes to CSS there was a fundamental disagreement that caused no end of pain for developers — Microsoft’s box model was different to everyone else’s! Mozilla and the other smaller players in the market used what has now become the default box model — the padding, border, and margin are external to the width (and height) of an HTML element. That is to say, the CSS width property refers to the width of the content area, not including any of the blank space around it. When you think about it, this is not logical! For example, a paragraph with a width of 300px, a padding of 10px and a border-width of 1px would appear on screen as a box that’s 322px wide (from outside border edge to outside border edge)! Microsoft did things differently, in older versions of IE the border and padding were internal to the width, so regardless of the padding or border thickness, a paragraph with a width of 300px would always be rendered as a 300px wide box, the content area would simply shrink and grow as you altered the padding and border widths. Initially, the W3C threw away the old IE-style box model completely, but in CSS 3 they added it back in as an alternative to the default box model. CSS 3 introduced the box-sizing CSS property for selecting the box model to be used for each element on a page. Rather than allowing users to choose between just the Netscape and IE approaches, they also added a third option where the padding is internal to the width, but the border is external to it. content-box – the width and height properties are interpreted as referring to the content width, with the padding, border-width, and margin external to it (the old Netscape approach, and the current default). padding-box — the width and height properties are interpreted as referring to the content width plus any padding. border-box — the width and height properties are interpreted as referring to the content width plus any padding plus the border width (the old IE approach). Why am I telling you all this? Simple, because Bootstrap changes the default box-sizing for all elements from content-box to border-box. In other words, Bootstrap changes your page from the counter-intuitive Netscape box model to the much more sensible IE box model. Layout — the CSS classes for defining page structure. These CSS classes are built to be responsive, that is to say, they allow the layouts you construct with them to behave differently depending on screen size. Content – the CSS classes for enhancing the standard HTML components, e.g. nice tables, nice block quotes, nice headers etc.. Components — the CSS classes for creating page elements that are not part of the HTML spec, but are none-the-less the kind of standard component that many web pages need, e.g. nice alert boxes, carousels, modal dialogues, badges, and so on. Utilities — the CSS classes for controlling very generic CSS properties in a concise, consistent and simple way. E.g. quickly setting consistent borders, padding, alignment, and so on. At this stage of our coding journey I expect you not to be intimidated by links to official documentation. I’m not going to be spending countless hours re-creating the excellent Bootstrap docs, instead, I’ll be linking to the relevant sections of the official docs. 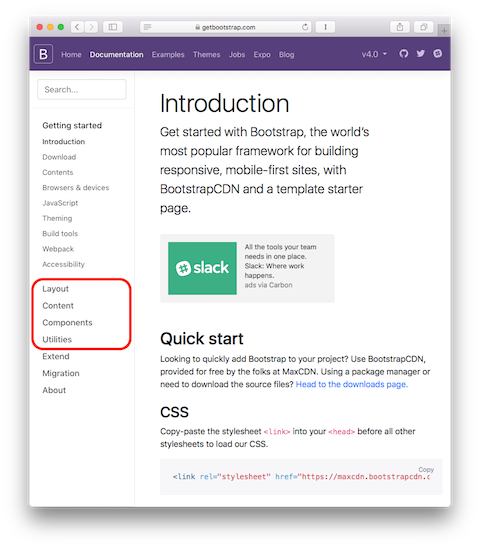 You can find the documentation at https://getbootstrap.com/docs/4.0/. To make things simple I’ve saved this template to Bootly.com at www.bootply.com/JcxTTJWslw. Now include Bootstrap 4 into the page by adding the needed <link> and <meta> tags to the page’s <head> section and notice how much better your recipe looks already! All we’ve done today is set the scene. Bootstrap is a very big API, so it’s going to take us quite some time to explore. 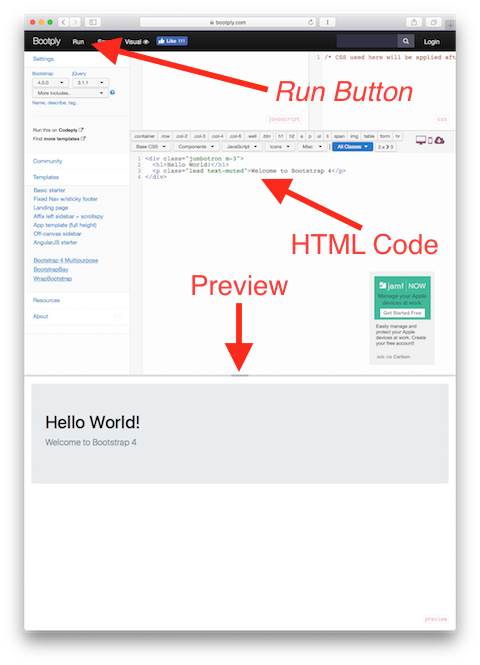 Next time we’ll start out exploration with a look at some of the utility classes Bootstrap offers.